Republicans celebrate the decline of unions. Indeed, Reagan’s union busting in 1981 when he defeated the air traffic controllers’ strike by hiring permanent replacements is seen as a watershed year, celebrated by Republicans and acknowledged by most researchers as a turning point in which corporations were given the green light to engage in union busting. New research by professors Bruce Western at Harvard and Jake Rosenfeld at the University of Washington, Seattle shows conclusively that the decline of unions in the private sector in the United States has contributed significantly to the growth of income inequality. Take a look at these two charts from the Economic Policy Institute. 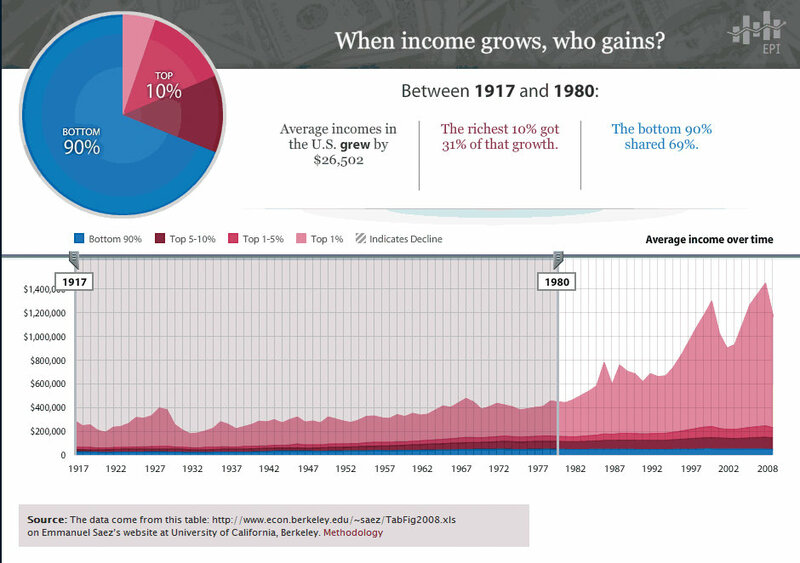 The first shows average income growth from 1917 to 1980. The second shows income growth in the U.S. from 1980 to 2008. During the 1917 to 1980 period average incomes in the U.S. grew by $26,502. The richest 10% of Americans enjoyed 31% of that growth. However, 69% of that growth went to the bottom 90%. After 1980, that changed. The second chart covering the period of 1980 to 2008 tells a decidedly different story. 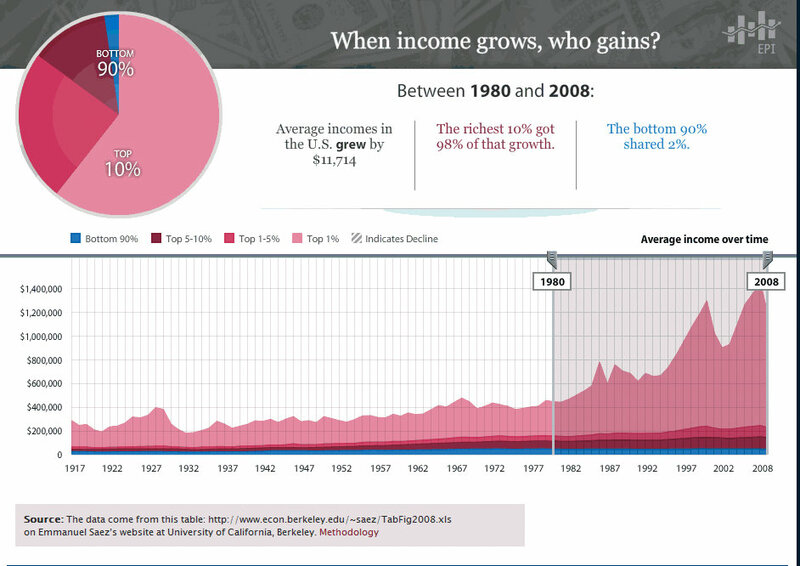 Average incomes grew but 98% of the growth went to the richest top 10% of Americans. The bottom 90% hardly saw any growth at all. The growth on income inequality in America parallels the decline of unions. 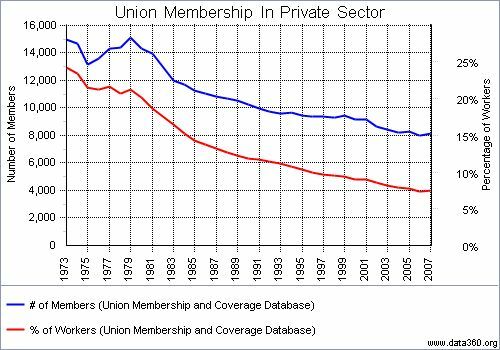 As the chart below shows, private sector union membership peaked in the 1970s and began a slow and steady decline after Reagan’s union busting in 1981. In their study, Western and Rosenfeld examined the impact of the decline of unions on income inequality from 1973 to 2007. Republicans are quick to argue that the growth of income inequality in the U.S. has been largely due to the up-skilling of jobs. In other words, increasingly jobs that are being created demand a college education. Republicans argue that the growth in income inequality is largely due to the relative increase in pay for college graduates compared to non-graduates. Western and Rosenfeld agree that this up-skilling has contributed to income inequality. However, they found strong evidence that the decline of unions has been a significant contributing factor also. In fact, they found that the decline of unions was responsible for as much as a third of the growth of income inequality among men and 16% of the growth of income inequality among women. In short, the income of the average working American, man or woman, has been significantly lowered by the decline of unions and this is true even if they worked in an occupation that wasn’t previously heavily unionized. Western and Rosenfeld offer several explanations for why the decline of unions would contribute to the growth of income inequality. 1. Unions raise the wages of less-educated and blue-collar workers thereby reducing educational and occupational income inequality. 2. Not only do unions raise the wages of unionized workers but the “spillover” or “threat” effect of unions raises the wages of non-unionized workers in similar industries, occupations, and localities since employers often respond to unionizing efforts by raising wages of their non-unionized employees in order to reduce the attractiveness of unions. 3. Unions are pillars of the moral economy in modern labor markets because they promote fair pay for low-pay workers and fight against the injustice of unchecked earnings growth of managers and owners. Unions accomplish this by making the case for economic equality in public speech and by organizing politically to influence public policy with regard to pay and benefits. The best way to protect your future income is to support unions. In short, if you want to understand why the rich keep getting richer and the poor and middle class struggle, look to the decline of unions. And, if you want to understand why unions have been in decline, look to the policy goals of the Republican Party. It all started with Reagan and it hasn't stopped. So, the next time you hear of a Republican effort to make it more difficult for workers to organize, remember that your future income is in jeopardy if they succeed, even if you don't work in a industry or occupation that ever has or ever will be unionized.